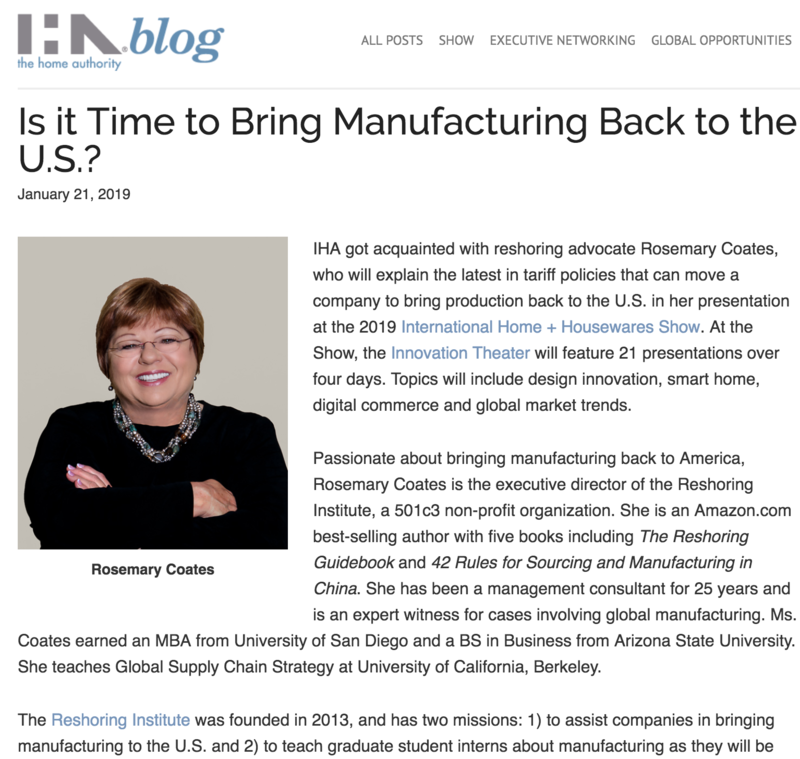 January 2019 – IHA got acquainted with reshoring advocate Rosemary Coates, who will explain the latest in tariff policies that can move a company to bring production back to the U.S. in her presentation at the 2019 International Home + Housewares Show. At the Show, the Innovation Theater will feature 21 presentations over four days. Topics will include design innovation, smart home, digital commerce and global market trends. January 2019 – Are you planning to leave China? 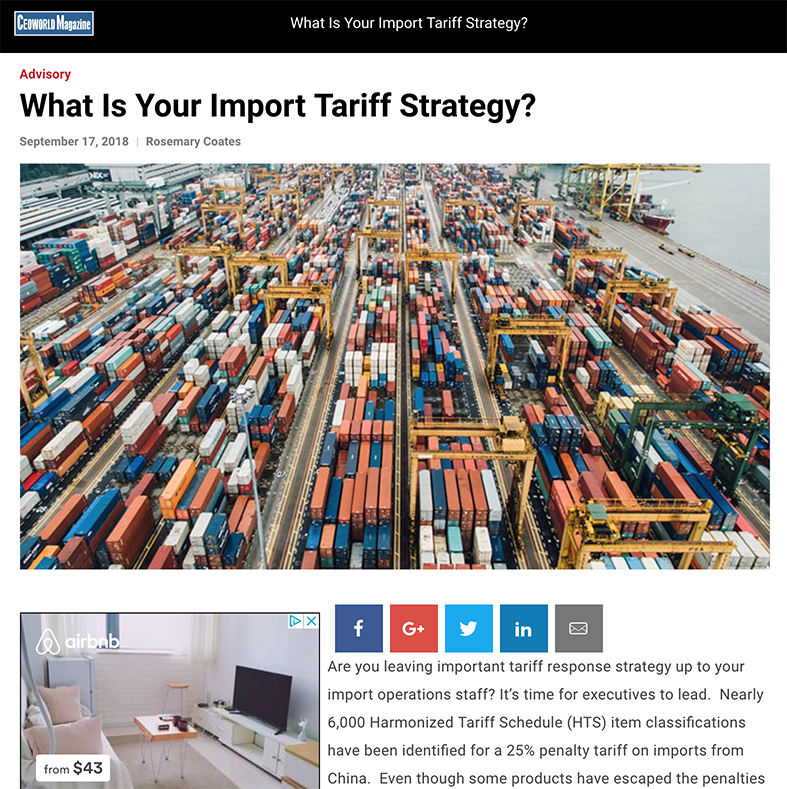 With nearly 6,000 Harmonized Tariff Schedule item classifications identified for the imposition of a 10% to 25% penalty tariff on imports from China, it is time to consider all your options. The future of new tariffs and penalties is uncertain. 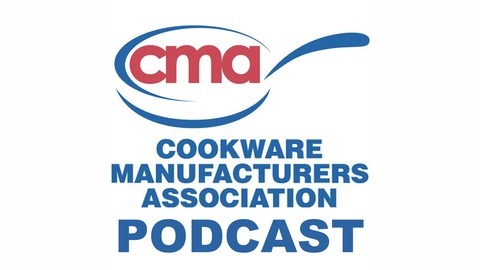 November 2018 – Join host Penny Rosema as talks with Global Supply Chain Consultant, Rosemary Coates as they cover the topic of US manufacturing and reshoring. 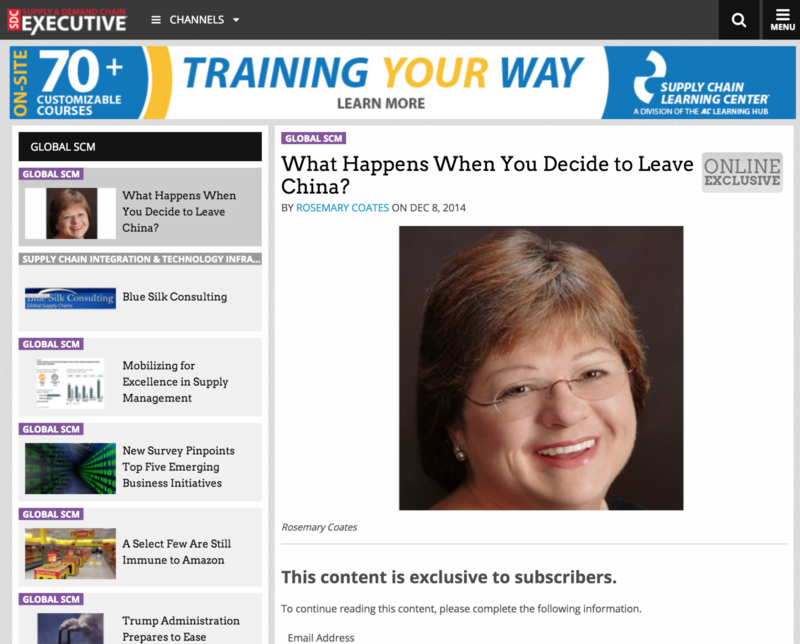 Rosemary is the Executive Director and Chairman of the Board at Reshoring Institute. November 2018 – American manufacturing is back—big time. 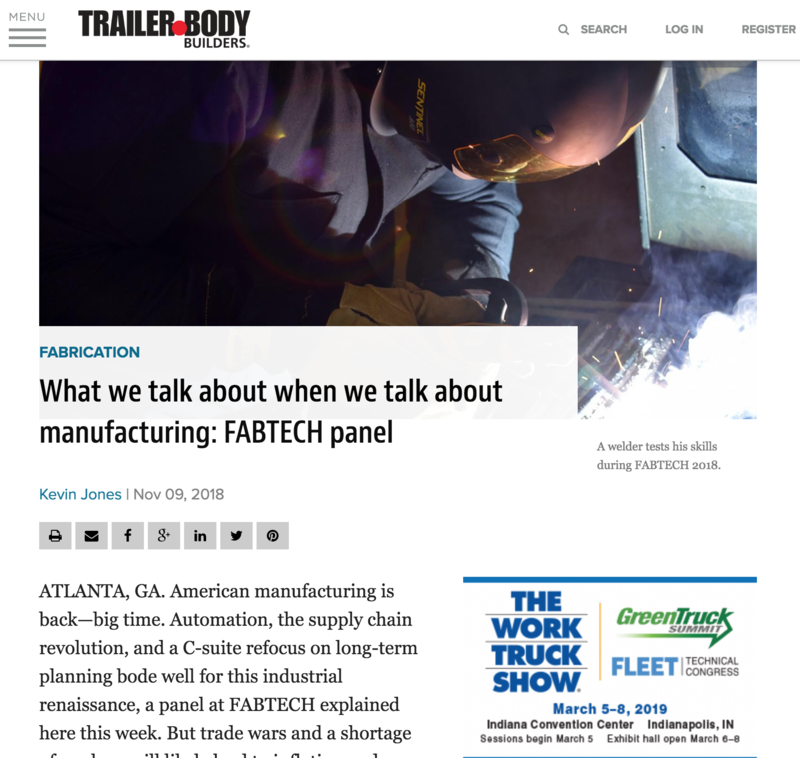 Automation, the supply chain revolution, and a C-suite refocus on long-term planning bode well for this industrial renaissance, a panel at FABTECH explained here this week. But trade wars and a shortage of workers will likely lead to inflation and a recession—a downturn that might only be an economic hiccup, or might not. What Is Your Import Tariff Strategy? September 2018 – Are you leaving important tariff response strategy up to your import operations staff? It’s time for executives to lead. Nearly 6,000 Harmonized Tariff Schedule (HTS) item classifications have been identified for a 25% penalty tariff on imports from China. Even though some products have escaped the penalties so far, the future of new tariff classifications is uncertain. Will your products be next? What is your strategic response to new penalty tariffs? What should your company be doing to avoid or mitigate penalty import tariffs? Nearly 6,000 Harmonized Tariff Schedule (HTS) item classifications have been identified for the imposition of a 25 percent penalty tariff on imports from China. 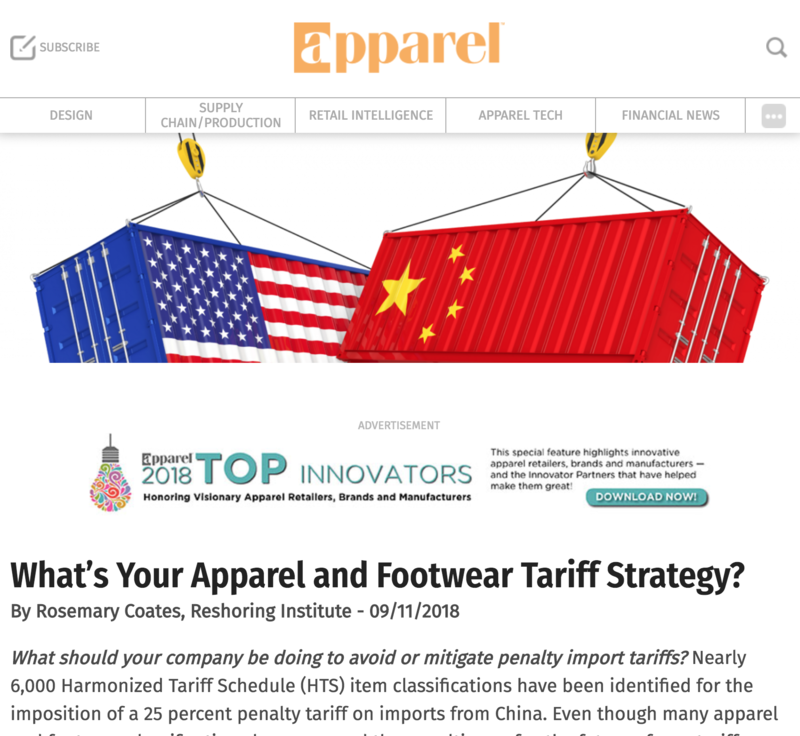 Even though many apparel and footwear classifications have escaped the penalties so far, the future of new tariff classifications is uncertain. Recently targeted products include sporting goods and some apparel items. Will your products be next? September 2017 – Developing a strategy for leaving a foreign location is a crucial part of reshoring that involves re-engineering processes, automating production and understanding all associated costs. December 2016 – A push is underway in the Rio Grande Valley to promote Bi-National Economic Development, or BiNED, which aims to develop advanced manufacturing — and the high-paying jobs it brings — on both sides of the border. Manufacturing is Leaving China – but is it Coming to the U.S.? June 2016 – The reshoring phenomenon is real. It’s driven by rising labor costs in China, and the increasing risk of maintaining long supply lines for western markets. What can companies do to bring that production back to the U.S.? March 25, 2016 – A growing movement to bring so-called “advanced manufacturing” back to the U.S. – a strategic effort dubbed “reshoring” or sometimes “nearshoring” – could significantly ramp up truck capacity demand as well, according to two experts. December 30, 2015 -Bright light reflects off the shiny exterior of row upon row of water heaters that stand like sentinels in Building 2 of General Electric Co.’s Appliance Park. The products soon will be shipped to retail stores such as Lowe’s, where they sell for about $1,000. The ordinary household product is part of an extraordinary turnaround story at one of Louisville’s largest employers and reflects the growing trend of reshoring: After decades of moving jobs to low-wage countries, American manufacturers are moving some jobs back to the U.S.
Reshoring, Bringing Manufacturing Jobs Back to U.S.
December 4, 2015 – Rosemary Coates, Founder of Blue Silk Consulting (WBE) and The Reshoring Institute, recently shared insightful information about how reshoring initiatives present opportunities for diverse suppliers, including woman-owned, minority owned and veteran-owned businesses. Learn more about how The Reshoring Institute supports the diversification of US supply chains in this guest blog authored by Ms. Rosemary Coates. December 1, 2015 – At the Supply Chain Outlook Summit, you talked about your roles as a consultant, advising clients on their outsourcing strategies and also as the executive director of the Reshoring Institute, advising companies on how to bring some of that manufacturing back to North America and the United States. In a sense, you’ve seen them going and coming. How do you describe what is going on in the market today?…. August 21, 2015 – The hottest trend in U.S. manufacturing is reshoring, and this means big opportunities for plastics manufacturers. According to a recent study by Boston Consulting Group, 54% of all U.S. companies with more than $1 billion in revenues are planning or considering reshoring at least some of their manufacturing. Wal-Mart’s U.S. manufacturing initiative promises to buy $250 million in U.S.-made consumer goods over 10 years. All of this reshoring will drive the need for plastic parts and products. December 23, 2014 – There’s more involved in successfully reshoring a foreign manufacturing operation back to the U.S. than simple cost comparisons. These initiatives have many moving parts and require careful planning. So where should a company begin? 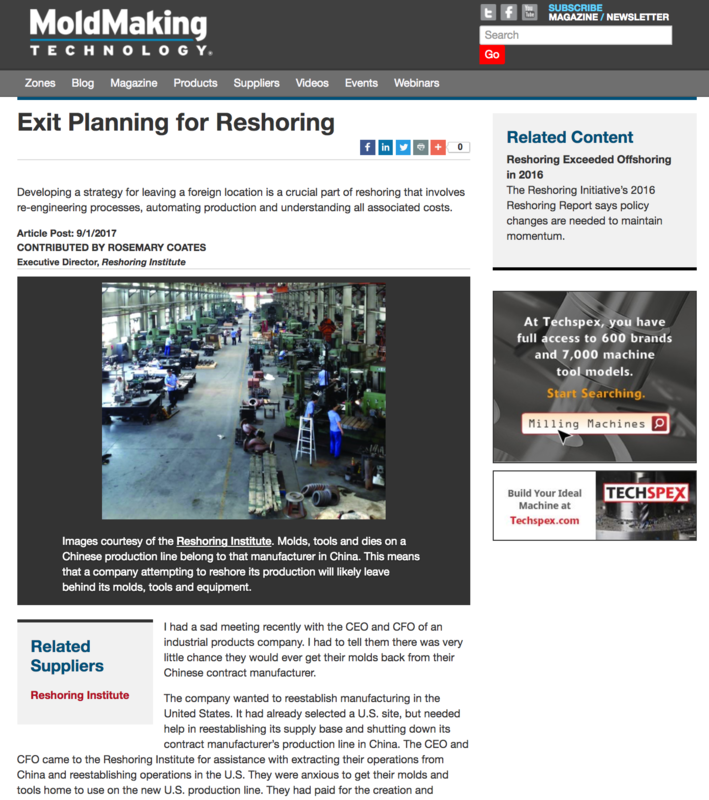 December 8, 2014 – Reshoring is the hottest trend in U.S. manufacturing. According to a recent study by Boston Consulting Group, 54 percent of all United States companies over $1 billion in revenues are planning or considering bringing at least some of their manufacturing back to the U.S.
November 26, 2014 – A million things can go wrong every day in business. So when companies consider a new, big project like Reshoring they need to be especially vigilant and prepared. We want to see manufacturing come back to America to rebuild our middle class and strengthen our economy. But it’s not as simple as shuttering the production plant in China and recreating it at home. Reshoring is a complicated project with lots of moving parts and potential points of failure. June 12, 2014 – Consider Otis Elevator. OE is one of many U.S. manufacturers, including GE, Whirlpool and NCR, which announced they were bringing factories back to the U.S. from China, Mexico and other countries and whose efforts did not go well. February 27, 2014 – There are many factors to consider when “rebalancing your manufacturing,” reshoring some operations to the U .S. and leaving others in place to serve the growing Asian market. Several of the important factors in the original offshoring decisions have dramatically changed. 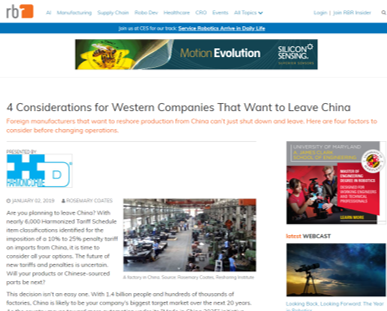 June 09, 2014 – Rising costs in China and shifting global economic forces are pressuring companies to reevaluate their global manufacturing strategies and consider localizing their operations. 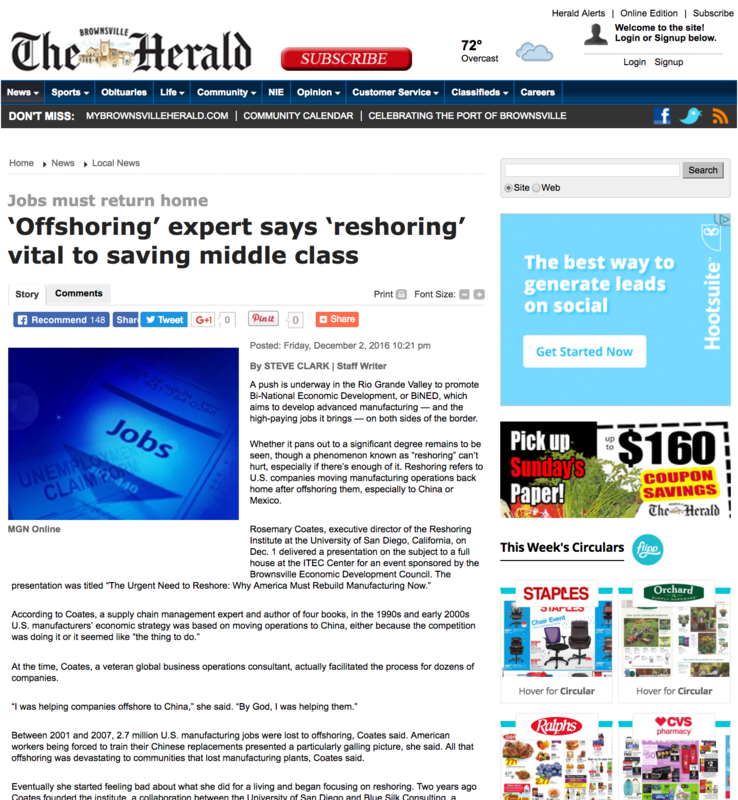 We’ve all heard the latest buzzwords: “reshoring,” “onshoring,” nearshoring and others. Some companies have started the process and have reported success. But many other companies are struggling with the reshoring. Will You Know When to Leave China? November 1, 2013 – Considered the “workshop of the world,” China is losing some of its cache’ as an unstoppable manufacturing powerhouse. Rising labor and energy costs are forcing manufacturers just like you to reconsider locating operations to even lower cost labor countries such as Vietnam and Indonesia.